Durham County is holding a hearing for citizens to air concerns about all matters having to do with the “Public Health.” Here is the official public release. Since December 2011, I have been trying to convince the city council and members of the health department that Fluoride is a dangerous chemical, NOT a dental health benefit we should be thanking them for. The movement has been slowly gaining steam all year and now we are reaching critical mass! Tomorrow I will be attending the hearing to present evidence that Fluoride should be stopped IMMEDIATELY and I am happy to report that I will be joined by WTVD Channel 11 and their camera crew. They will be there to capture footage specifically for a fall report on this very issue! So if you can, please join us to express your concern and demand a change in policy! His own 11 year old daughter has mild dental fluorosis, the negative side effect to fluoridating our drinking water. Even those who are supposed to be looking out for our best interest admit the negative side effects of Fluoridation – incredible! Join Durham’s Movement to Stop Medicating the Public Water Supply! We are a group of citizens dedicated to ending the medication of our water supply! Please follow the links in the menu to learn more about what you’re drinking every day. Did you know that our water department has been adding Fluoride to the drinking water since the 1950’s? If not, you should know the facts! Residents of the City of Durham pay over $100,000 per/year to add a highly toxic, corrosive, industrial waste known as Hydrofluosilicic acid to our water supply. Most people are told this is beneficial for our teeth, but look! The facts are this: Fluoride was thought to be a dental health benefit, however, new science comes out yearly to prove otherwise. 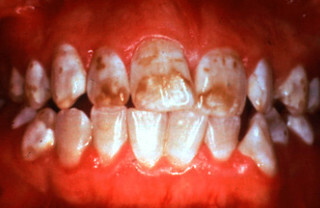 Dental fluorosis is rampant and the Center for Disease Control (CDC) has said that over 40% of adolescent youth now have to face a life with some degree of mottled teeth. Have you ever wondered why it is in the drinking water when our own toothpaste tells us not to swallow it? LISTEN TO MY FORMAL REQUEST FOR INFORMATION @ DURHAM CITY COUNCIL MARCH, 22, 2012 (Click item 22 Corey M. Sturmer)!